Colombo, Dehiwala, Nedumal Sri Venkadeswara Maha Vishnu’s Maha Kumbabheshekam (Consecration Ceremony) was held recently. Mr Ramaratna Ratnarajah, Chief Trustee of the Temple made all the necessary arrangements with the help of the devotees and the Temple’s Chief Priest “VISHNU Pooja Thurantharar Bramasri”, Chandrakantha” performed all the poojas and rituals to the greatest satisfaction of the devotees. Maha Vishnu is venerated by a large number of devotees as the preserver of the universe. Lord Vishnu is one of the Thirumurthi Gods of the Hindu Pantheon. In Sri Lanka He is specially revered as the Custodian of the Island. Vaishnavites venerate him as the Supreme Deity. The Vishnu Purana, a work of the 1st century (B.C) extols his attributes. Known in the early vedic times as a manifestation of Solar Energy, he later became a deity of major importance and along with “Brahma” and “Shiva” formed the Holy Thirumuthikal of Hinduism. All things emanate from him say the Vaishnavites. In mythology, while Brahma performs creations, Vishnu preserves the lives of all and sundry in the universe.He is the embodiment of goodness and mercy. Because of his acts of preservation and duration, he is a symbol of perpetual life and earns the name “Narayana” meaning the “abode of man”. Further, the sacred temple of Maha Vishnu at Nedimale, off Anderson Road, Dehiwela has its beginning in the 18th century. A Vaishnavite devotee supervisor who was engaged in the excavation of the Dutch Canal near Dehiwela had a vision. He was told to seek a particular place for his devotion to Lord Vishnu, his patron Deity. He gave up his search in the jungle neighbouring Dehiwela after an initial attempt. However, the vision occurred again, so he set forth with a determination this time. Curiously, a young cow calf proceeded ahead of him and stopped at a particular spot in the jungle. To his amazement, the devotee found that it was a hallowed place. There were the ruins of a well and all the signs of a one time Vaishnava Temple which had been eclipsed. Tulasi plants, sacred to the Lord Vishnu flourished there. 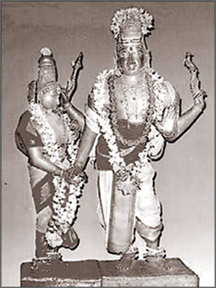 Though there were several devotees of Lord Vishnu, looking after this temple, a devotee of this Deity by the name “Ramaratnam” was indeed responsible for making this temple popular by performing daily poojas and annual festivals with the assistance and co-operation of the people of the adjoining areas. In fact, this temple is a miraculous one and is venerated by several Buddhists and Hindus in large numbers now. Besides, several Lord Vishnu’s devotees and philanthropists have fabulously and fantastically donated for numerous renovation, restoration and re-construction works at this temple. The daily poojas and annual festivals are conducted according to Agamas and particularly and every Sunday special poojas are performed and “Annathanam” is given to devotees who come to this temple in large numbers from all parts of Colombo and even from Negombo and Chilaw areas. In fact, this Vishnu Temple has now become to be venerated as a veritable “Thirupathy Shrine” in India. The Vishnus consort is Maha Lakshmi and according to mythology she arose from the milky ocean when it was churned by Devas in search of perpetual life. She became the Divine Consort of Maha Vishnu who was masterminding the churning operation. She is personified as the embodiment of grace and charm and is venerated as the Goddess of well-being and fortune. She is usually depicted standing or seated on a lotus pedestal. Further, Maha Vishnu’s vehicle “VAHANUM” is the mythical bird “GARUDA” and it has the face and beak of a vulture and the body of a human. It is conceived as a very powerful and strong enough to convey Maha Vishnu is all his journey to the cosmic world. Further, in all the Maha Vishnu’s temples the statue of “GARUDA” occupies a prominent place facing the Deity. “Maha Vishnu” is the greatest “Karma Yogi” of all times. He was the friend of the poor and was the embodiment of humility. There was none to match Maha Vishnu in beauty, in wisdom and perfection. He embodied in Himself all the great qualities of the head, heart and hand. Every word of his teachings and every act of his life was full of substance and meaning. As the preserver of the universe Maha Vishnu is the object of devotion and he is considered on earth as a great hero to save mankind and to establish Dharma or righteousness. In “Ramayana”, he was born as “Rama” and in “Maha Bharatha”, he was born as Lord Vishnu and performed several miracles and helped his devotees. He assumed several births known as incarnations or Avatars in various forms to establish Dharma when Adharma prevailed in the world. Even the Bhagavad Geetha declares as follows:- “Whenever there is decay of righteousness and rise of Adharma or unrighteousness, then I myself shall comeforth to destroy the unrighteous and save the righteous and to re-establish Dharma”. In Maha Bharatha, Lord Maha Vishnu was born as Krishna to protect “Pandavas from Kauravas. When ARJUNA went to the battle ground and was reluctant to fight when he saw his Guru “Bhushmar”, DURONAR and all his relations, told Krishna started teaching his “Bhagavad Geetha”. He told ARJUNA, that “this world is a battle ground and there will be problems like waves in the sea. As such, one should not run away from problems. He looked at ARJUNA and said that “your duty is to fight irrespective of consequences and thereafter “ARJUNA” got the courage and strength and fought the battle. Lord Krishna further said “that this world is plagued by endless and myriad of problems. The solutions to these problems lie in the integrated development of individual personality. In order to direct this power in the right way, one should strive for intellectual enhancement, evaluate confusing situations and derive constructive conclusions. In Bhagavad Geetha Lord Krishna assures with Divine eloquence that success is one’s birthright. Further, Lord Krishna was a formidable warrior, an unsurpassed statesman, and greatest philosopher. In the Kurushetra battle, Lord Krishna declares himself as the teacher of universe and revealed to Arjuna the man’s profound knowledge and expounded the importance of duty above everything else. This was how Lord Krishna happened to deliver the eternal message of Bhagavad Geeta to “Arjuna” in the battle field. Furthermore, Maha Vishnu took ten major incarnations or Avatars. They are “Majsya” avatar or fish incarnation. Once, when a great deluge destroyed the whole world, Maha Vishnu as a fish rescued the “SPIRITUALMANU” to originate the present human race. His second incarnation was “KURMA AVATAR” or the tortoise incarnation. As a tortoise, he descended to the bottom of the ocean and saved the “DEVAS” from extinction. His THIRD incarnation was “VARAHA” avatar or BOAR incarnation and saved the world when it was drowned in the ocean by a demon. His forth avatar was “Narasimha” incarnation. In this Maha Vishnu incarnated himself as a “Man-Lion” to destroy the “DEMON IRANIAN” who was ill-treating his devotee “PRAHALADAR” who was happened to be “IRANIAN’s own son. Maha Vishnu’s fifth Avatar was “Vamana” incarnation. He incarnated himself as a dwarf Brahmin and destroyed “MAHABALI” who created a dehumanizing and emasculating fear into the minds of the people. His sixth Avatar was “PARASURAMA” incarnation. His seventh “Avatar” was “Bala Rama” incarnation and his eighth Avatar was “King Rama” to destroy Ravana and his nineth Avatar was “Lord Vishnu” to save “Pancha Pandavar” from wicked Duryodana. Undoubtedly, to a world lost in error and weighed down by forces of darkness of ignorance and egoistic arrogance, conflicts and contradictions, trials and tribulations, let us worship Dehiwela Nedumal Sri Venkadeswara Maha Vishnu and utter His pure name and contemplate and surrender ourselves at his Lotus feet for the progress and success of our lives and also for peace, prosperity, racial harmony, happiness, unity, amity and sanity in Sri Lanka. The worship of Siva, as the Supreme, the Absolute, is the oldest and most wide-spread of all religions of antiquity. Tradition claims it to be as old as creation itself. Centuries before Himalayas rose and became the symbol of spiritual tradition, Siva cult was prevalent all over the vast Indo-African-Polynesian continent of which our little Ceylon formed also a part. Archaeological discoveries by Sir John Marshall in the Indus valley and George Febrei and others in Malta, Madagascar and Crete, seem to indicate that nearly ten thousand years ago Siva was worshipped as Maha Deva-the great God- a form of proto-Saivaism. The seals found at Mohenja-Daro also depict the God as a deity with three faces – the Trinity ideal-possibly a version of Brahma, Vishnu and Siva of later date. The Trimugha (three-faced) Siva of 3,000 B.C., is of as much interest as the single-faced deity of the earlier seals. According to the Puranas there were 1,008 Siva temples in the Northern regions beyond Himalayas, 1,008 between Himalayas and Cape Comorin and 1,008 in the continent South of Cape Comorin. Ceylon is only a dot in the vast third area. Thiruketheeswaram, in the village of Mantota is one of the two most sacred pre-historic temples in Ceylon which have been referred to in Sanskrit Classical Literature and received laudatory hymns from Saiva Saints. The other is Koneswara (Trincomalee). They are reputed as Dakshana (Southern) Kailas, as counterpart of Northern Kailas, which is in the Himalayas. Ravana, the King of Lanka, was a devotee of Koneswara and his father-in-law Mayan, is said to have built the ancient temple at Thiruketheeswaram. 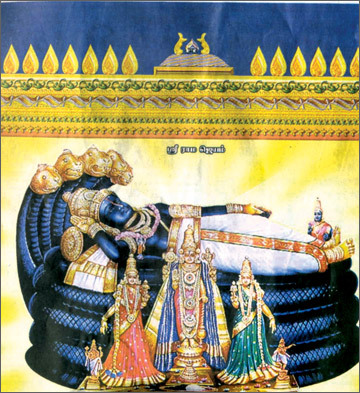 Rama, who built the Sivan temple at Rameshwaram, on his way back to Ayodhya from Lanka, is reputed to have worshipped Lord Siva at Thiruketheeswaram as well. According to tradition, Arjuna, the hero of Mahabaratha was and the kinsman and disciple of Lord Krishna, also visited Thiruketheeswaram in the course of his pilgrimage to the South. It is said that it was during those travels that he met the Naga Princess, Alli Arasani, who ruled over the region adjoining Mantota. Some ruins on the mainland North of Mannar Island are to-day pointed out as the forts of Alli. According to Buddhist literature, the place was known as Mahatittha from third century B.C. If, as claimed by certain scholars in accord with tradition, Rama, Agastyar and Arjuna crossed over to Lanka through this harbour at Mantota, it may be surmised that Prince Vijaya too and his party came by the same route. If so, the Sivan Temple at which Upatissa, the Brahmin priest, who accompanied Vijaya, is said to have performed Poojah cannot be any other shrine than Thiruketheeswaram itself. 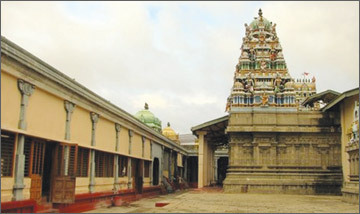 In the mediaeval period, the Pandian Kings were devoted to Lord Ketheeswara and improvements to His Temple had been effected by them in the sixth century A. D., by which time the sea-port, Maha Thuvadda (Matota) had become Mantota. The waves of the sea adjoining the temple reached the skies and its roar vied with the festival drums and suppressed all other sounds of the thickly populated country-side, implying that at that time ocean-going vessels could have passed through the creek between. Mannar Island and the mainland, which has since become much silted up and more so during British times owing to two obstructions recently built, namely, the causeway for the road and the railway track. The harbour itself was a safe refuge for many ships from various countries which crowded into it at any one time. The city of Mantota was rich with gold, pearls and precious stones. In its groves of coconut, mango, arecanut and plantain the density of trees was so great that monkeys sported from branch to branch and flocks of peacocks danced in their cool shade. The scent from the flowers of the well laid gardens oppressed the air and the hum of swarms of bees which kept on flitting from flower to flower, shrub to shrub, competed with the strains of music emanating from the homes of citizens. This prosperity is in keeping with the description in Raja Ratna Kara of the suzerainty of the Tamils in what was then the most populated parts of Ceylon during the ninth and tenth centuries. The next two centuries were periods of even greater progress and by 1,028 A.D., during the reign of Rajendra Chola, Mantota was a beautiful city of 10 square miles with broad roads, palatial buildings, etc. 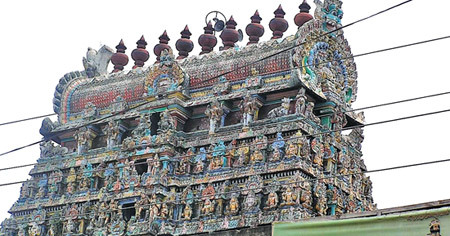 The temple had seven Prakarams (circuits) and tall towers on all four sides of each circuit, as in the case of present temples of Madura or Srirangam. Besides vast paddy fields in the neighbouring areas, there was also sugar cane cultivation; and weaving industry flourished. Inscriptions in support of these statements are said to be extant. Sixteenth to the Eighteenth centuries were the darkest periods in the history of Thiruketheeswara. Besides ravages caused by nature and neglect, the Portuguese invaders destroyed the Temple and ravaged the city and, literally, carried away its stones. The Dutch saw to it that nothing happened here. At the Thirukkadaiyur Abhirami temple in India many years ago, there lived a staunch devotee of the Goddess Abhirami named Subramaniam. He loved the Goddess so much that he saw her everywhere and in everyone, but especially in all women. Any woman that entered the temple he would offer flowers and worship her as the living embodiment of the Goddess. One day, King Saraboji visited the temple as Subramaniam was meditating on the glories of Abhirami. Seeing that Subramaniam did not bow before him as he entered the temple, the king became irritated. He asked one of the devotees in the temple who this man was that refused to recognize him. One priest told the king that Subramaniam was mad, worshipping all women as the Divine Mother and showering them with flowers. However, another priest of the temple overheard this and corrected the man, saying that Subramaniam was truly a saint and a great devotee of Mother Abhirami. The king, confused by the two conflicting accounts of who this man was, decided to put Subramaniam to the test. Therefore, he asked Subramaniam whether today was a full moon day or a new moon day. At that time, Subramaniam was still absorbed in meditation on the Divine Mother, seeing her shining face in his mind. Subramaniam, seeing the Goddess’ face and mistaking it for the moon, responded to the king saying that it was a full moon day when it was actually a new moon day. The king, deciding that Subramaniam must be mad, ordered that he be burnt at dusk if the moon failed to appear. After some time, the king’s army awakened Subramaniam and ordered him to come with them to be executed for his madness. On returning to ordinary consciousness, Subramaniam realized that he had mistaken the face of the Divine Mother for the full moon, making him say it was a full moon day when, in actuallity, it was a new moon day. Standing at the pyre, with the flames rising all around him, Subramaniam realized that only the Divine Mother could save him now. He began singing a song of one-hundred praises to Abhirami (the so-called Abhirami Antati or ‘Song to Abhirami’), begging her to come to his rescue. While singing the seventy-ninth verse of his song, which states that the Divine Mother is an ocean of blessing without limit whose merciful eyes grant liberation, Mother Abhirami appeared before Subramaniam, his executioners, and the unbelieving king. Throwing her earrings into the sky, it took the form of the full moon.